Exotic, striking and perfect for both men and women, Tropical flowers make for a unique gift with major wow factor! Popular Tropical flowers include the long-lasting Phalaenopsis Orchid, as well as the bright and beautiful Cymbidium Orchid which is a winter must have. Other Tropical flower favourites include Birds of Paradise. Famed for their striking orange bloom, these exotic flowers look sensational in many different styles of arrangements as well as table centrepieces. Ti Leaves and Bamboo canes feature prominently in many of our designs and are guaranteed to transport the lucky recipient to a Tropical Oasis! Tropical flower designs are a popular selection for a variety of special occasions including Birthdays, or as a stylish gift to corporate partners or employees. 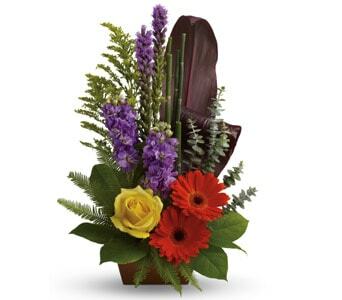 They�re also a great floral pick me up to send during the cooler months!